Description - Pre cut heavy duty rubber rolls offer a discount priced rubber flooring solution that is designed for home and commercial use. These rolls are durable, easy to install, and come with a full 5 year warranty. It is normal for your rolls to arrive with a few extra inches. Material – Recycled rubber buffings and EPDM virgin rubber flecks at varying color densities. Recommended Uses – Pre cut heavy duty rubber rolls have been used as commercial and residential gym flooring, as flooring for indoor running tracks and runway flooring, as weight room flooring, in commercial exercise rooms under exercise equipment, in areas where spike and blade protection might be needed such as around ice skating rinks, baseball dugouts, and golf locker rooms, and in any other location where an anti slip rubber flooring solution would be useful. Vacuuming any loose crumbs, dirt, dust, or debris from the rubber floor covering when necessary. Occasional damp mopping of the flooring rolls with a mild soap and water solution. A few recommended soaps are Dawn dish detergent or Tide laundry detergent. Note: Do not use any solvent or oil style cleaners such as Pinesol, Lysol, Murphy’s Oil Soap, WD40, paint thinner, etc. since these types of cleaners will break down the flooring over time. For more detailed cleaning instructions and commercial cleaning instructions, Click Here. First you will want to clean your sub floor so that it is free of all dust, dirt, and debris. Loose lay your rolls in the room as you would like them to look after a complete installation. Let the rolls relax for up to 24-48 hours to ensure proper installation of your new flooring. Note: Rolls may be directional so make sure the color matches on each roll. If the roll colors do not match, flip them or turn them 180 degrees to ensure color matches. Make any necessary cuts to the rolls to fit them into the room using a Straight Edge and a Utility Knife with a fresh blade. We recommend leaving a gap around the rolls roughly the thickness of the rolls being used to account for expansion and contraction. Apply double sided tape to perimeter of each roll. Place rubber rolls back into position on top of the double sided tape. First clean your sub floor so that it is free of all dirt, dust and debris. Also, when gluing your flooring down, it is recommended that the sub floor is free of any moisture. Roll up the rolls at one end of the room. Put down a 10 foot long light layer of polyurethane adhesive and unroll 10 of the flooring into the adhesive at a time. Repeat this step for every 10 feet of roll length until the entire roll has been unrolled into it desired position. After all rolls have been glued down, it is often recommended to use a 100 pound roller on the floor in order to guarantee good adherence to the sub floor. If a roller is not available, walking on the flooring in small choppy steps may also work. Guaranteed lowest cost 3/8" rolled rubber available online. 25' rolls ship in 1-2 bus. days. Does this flooring have a fire rating? Our 3/8" Pre-Cut Heavy Duty Rubber Rolls are Class III fire rated. Can this be used as gararge flooring? The only time when there will be an issue is when your car leaks oil. If your car leaks oil, over time the rubber flooring will breakdown. Looking for flooring that would work over low pile carpet. 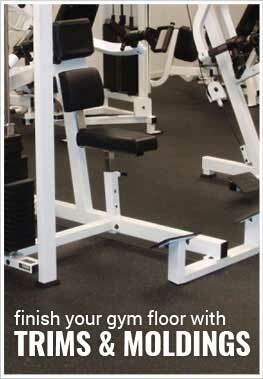 Plan to put exercise equipment on it. Our 3/8" Pre Cut Heavy Duty Rubber Rolls can be installed over low pile commercial carpet with ease. Is this appropriate as a carpet for an outside patio? Do the edges need finishing ? Our 3/8" Pre Cut Heavy Duty Rubber Rolls can be used as flooring in an outside patio. The flooring comes with three sides finished. You would need to cut one edge to fit your space. What`s difference between pre-cut heavy duty and regular heavy duty? The only difference between our 3/8" Pre-Cut Heavy Duty Rubber Rolls and our 3/8" Heavy Duty Rubber Rolls is that the Pre-Cut Rolls only come in select sizes. They are 10', 15', 25', and 50'. Our standard product can be ordered in any size with the minimum cut being 15'. Our Pre-Cut Rubber Rolls also ship faster with lead times of 1-3 business days. 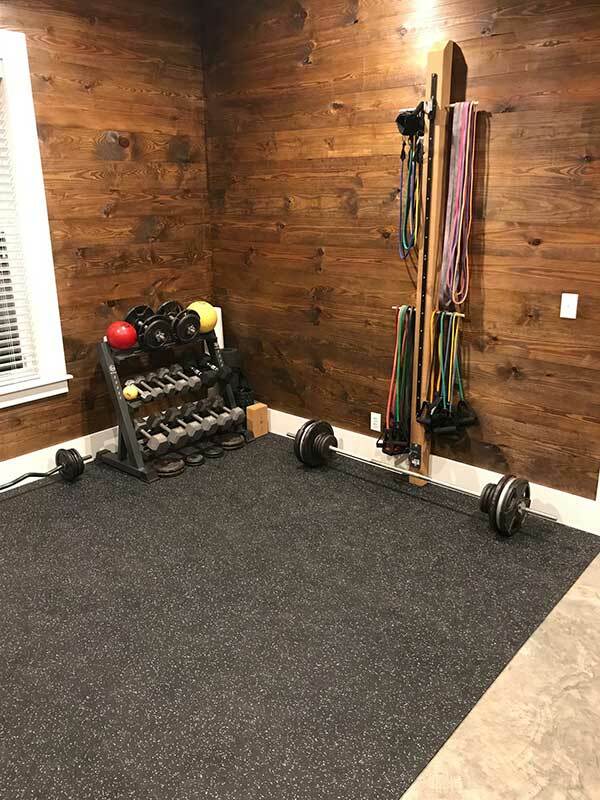 Laid this down in a 16x24 home gym for my wife. She's very happy with its appearance and feel. It laid down with a few bubbles on the seams but we warmed up the room and the seems laid flat and now appear seamless. Make sure you square the end before starting, the rolls do not come cut square on the ends. The pre-cut rubber rolls I purchased were a perfect fit perfectly in my garage space. I feels good under foot and is easy to keep clean with a damp mop. I’m very very happy with the product We put it into an apartment Fitness Center and the rolls we the perfect length. We did two rooms. The first I had our flooring installer put it down and he insisted that gluing it down was the best way to go. He used to much glue and wasn’t good about keeping the edges tight and yellow glue leaked up. It took as much time to clean up his mess as it took to put it down. I watch the install instructions on YouTube and decided to do the instal in the second room myself using tape under the seams. Though This was my first time trying to lay this type of floor it went down quickly and looks great! Follow the instructions and it goes down great. I was concerned about how much it might smell, but it was not an issue. I would buy this product again in a heartbeat, but I’m looking for a new flooring installer! Very nice finished product. 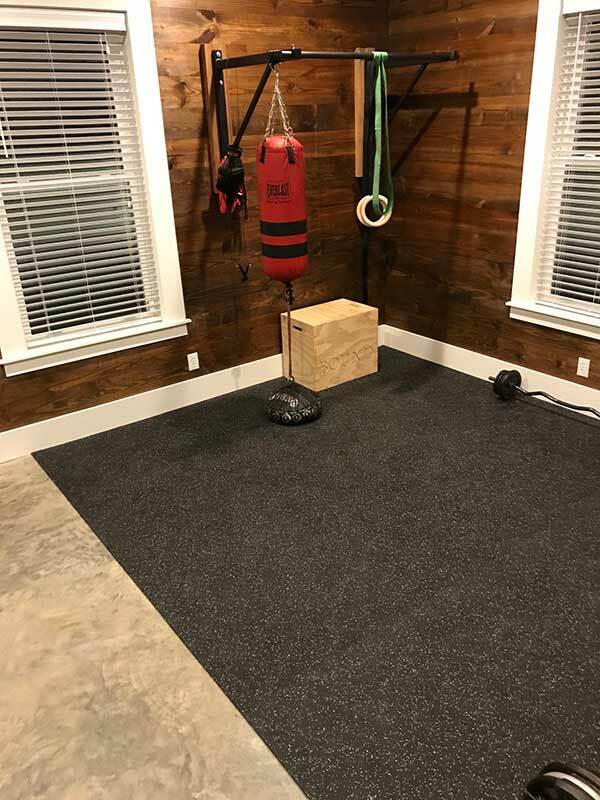 I installed 120 sf in approximately 1 hour with no previous experience with rubber flooring. Attractive even indoors as this was installed inside my home.